People say good things about this Harvard College. Notable folks graduate from there. Big minds. Henry Kissinger. Ted Kaczynski. And Jeremy Lin. The Linsanity sweeping New York and the nation right now would seem to suggest that Harvard is not much of a basketball school, and that's a fair read. 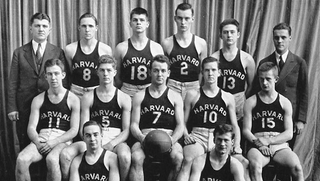 But Lin's NBA success would also seem to suggest that Harvard's best hooping days came when Lin toiled in Cambridge. And that bit isn't true: Jeremy Lin's Crimson were 1-5 against Cornell. Things were much better back in 1946. Stefan Fatsis explains, on this week's excerpt from Slate's Hang Up and Listen podcast.